These decadent truffles with a touch of Christmas make a fantastic edible gift! Combine fruit cake, Muscat, coffee mixture, almond meal and jam in a bowl, mix well to combine. Roll heaped tablespoons of mixture into balls and place onto a lined tray. Refrigerate until firm. Melt the Toblerone* and copha in a bowl over a saucepan of simmering water. Using two forks dip each of the balls into the chocolate to cover. Drain off excess chocolate and place back onto the lined tray. 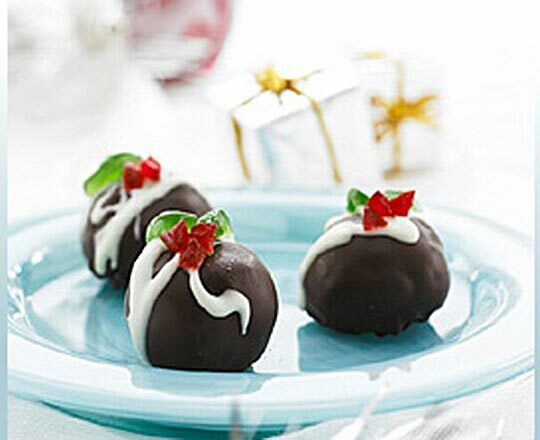 Drizzle the truffles with white chocolate and decorate with glace cherries to resemble holly. Allow to firm and set before serving.